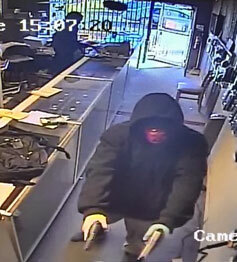 INDIANAPOLIS – The Bureau of Alcohol, Tobacco, Firearms and Explosives (ATF) and the National Shooting Sports Foundation (NSSF) – the trade association for the firearms industry – announced a reward for information leading to the arrest and conviction of those responsible for the armed robbery of KS&E Sports, a federal firearms licensee located in Lawrence, Ind. ATF is offering a reward of up to $10,000, which will be matched by the NSSF for a total possible reward of $20,000. At approximately 3 p.m. on Monday, Nov. 3, 2015, three individuals wearing masks and gloves and carrying weapons entered KS&E Sports, located on Pendleton Pike, in Lawrence. The individuals subdued the store owner, an employee, and a customer and stole 43 firearms, including handguns, semi-automatic rifles, and tactical shotguns. Although the injuries were non-life threatening, the owner was struck with a firearm by one of the suspects. The incident was recorded on video. ATF is working with the Lawrence Police Department to investigate the incident. Anyone having information about this burglary or recognizing the individuals in the attached photos taken from the surveillance video should contact ATF at 1-800-ATF-GUNS (800-283-4867). All calls will be kept confidential.